Below, four cutting edge EIS/SEIS qualified startups in the fields of science and technology that promise to generate significant value. Blu Wireless Technology (‘Blu Wireless’) provides the technology to allow data to be transmitted wirelessly at very high fibre-like speeds. Blu Wireless addresses the challenge of building cost effective 5G networks, rolling out fibre-like broadband to businesses and homes, reliable connectivity on high-speed transport and low latency video streaming in the home. The company is a key player in the growth of high frequency (mmWave) wireless communication, which allows for multi-gigabit per second data transfer and has been heralded as the future for ultra-fast wireless technology, used in routers, laptops, smartphones, virtual reality headsets, as well being vital to the roll-out of 5G networks. Blu Wireless has been awarded two government contracts for projects with the Department for Digital, Culture, Media and Sports (DCMS) as part of the UK’s 5G Strategy. Blu Wireless’ fixed wireless broadband technology is being used in the Liverpool Testbed to support the NHS and its high speed transport technology is being used in the Auto Air Testbed in relation to connected autonomous vehicles. Blu Wireless’s technology and potential has been underlined and strengthened by the long term strategic investment by Arm, which has invested as a strategic investor alongside Calculus Capital in each of the latest rounds. Blu Wireless has so far secured £16.4 million of investment, including £4.5m from Calculus Capital and £5m from Arm. Funds are being used to further accelerate the company’s commercialisation strategy and support its R&D program. 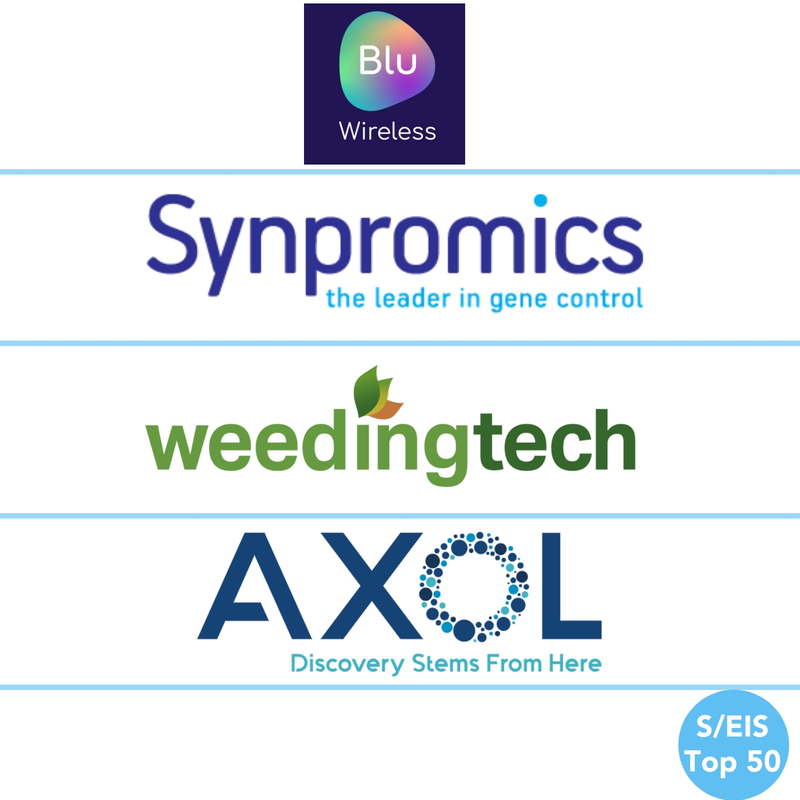 Synpromics is the leader in gene control, aiming to improve human health by enabling safer, more effective cell and gene medicines through proprietary genomics, bioinformatics and intelligent data-driven design. They have developed a tool they call PromPT®, a multi-dimensional bioinformatics database which is helping to power the next generation of cell and gene based medicines and bioprocessing applications. The Company recently announced positive results in collaboration with uniQure for the delivery of gene medicines to the liver, following data demonstrating that Synpromics’ highly selective liver promoter is at least eight times more potent than the current industry standard. Synpromics was ranked 12th at the 2018 Deloitte ‘UK Technology Fast 50’ awards ceremony, which recognises the country’s 50 fastest growing technology companies based on revenue growth. In addition, David Venables, CEO of the Company, won the ‘Disruptor’ category of Scotland’s EY Entrepreneur of the Year. To date, Synpromics has secured investment of £5.6m from Calculus Capital, which has been used to further develop and exemplify the proprietary promoter design platform, as well as to support the growth of collaborative partnership agreements. Weedingtech is a world leader in herbicide-free, non-toxic weed and moss control. Its proprietary Foamstream technology uses a combination of heat and chemical-free foam to kill weeds and moss, offering municipal and agricultural markets a viable and sustainable alternative to commonly-used herbicides which are increasingly associated with serious health issues. Significant customers now include the Cities of Munich, Porto, Barcelona and Florence and the Swedish MOD in Continental Europe; London Borough of Hammersmith and Fulham, Wessex Water and AMEY in the UK; and Toronto Metro (Canada), the Cities of Seattle (WA) and Orange Town (NY), the NY State Department of Environmental Protection and Central Park, New York City in North America. Weedingtech has so far secured £4.5 million in investment. Funds have been used to launch three new products into the market and to enhance the North American and European sales capabilities. Axol creates high quality human cells using stem cell technology, and provides them to many of a number of major pharma companies and research institutions, for medical research, disease modelling and drug development. Axol generates stem cells from blood and tissue cells, extracted from healthy and diseased patients. These cells are able to self-renew and may be used to become any tissue in the human body, such as heart and brain cells. Importantly, Axol’s unique and innovative approach to this process means that each cell line it produces for customers will be identical to the last production batch, ensuring the quality and consistency required for research and drug development projects. Once a new cell line is developed from a healthy or diseased individual, it is added to Axol’s suite of ‘off the shelf’ products which may be purchased on their website. The combination of these properties means the stem cells supplied by Axol are hugely important for research into treatments for many serious illnesses and diseases, including Alzheimer’s and Huntington’s. Axol has had £4.8m invested to date (£2.5m from Calculus Capital and £2.3m from previous investors). The investment has been used to expand their product range, strengthen the team (as well as sales and marketing capabilities) and open a US base. Follow us on Twitter and LinkedIn for more EIS success stories and investment opportunities. 2019 EISA All rights reserved.